Preface – My son, Michael, is celebrating his 11th birthday today, so I let him pick the sentence to start. Thanks so much to Jim B. for his willingness to trade out his submission for another time. 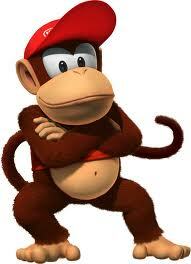 Mario arrived in Kongo Jungle to capture Donkey Kong’s banana stash, ready to deal with Diddy Kong. As soon as Mario’s feet touched the shore, even before he could take off his tanooki suit, barrel’s were raging toward him. Diddy stood on top of the bank, gleeful, hurling one after the other. Dodging and jumping over the barrel’s, Mario carefully made his way up the sand, closer to Diddy. Mario’s last attempt had been a complete failure, thanks to Diddy, and Mario was not going home to the Mushroom Kingdom empty handed this time. Diddy jumped and flipped with excitement, watching Mario struggle up the hill. Mario let him have his moment of glory. Last time Mario only came with his hammer, but this time he was ready. As the next barrel came rumbling toward Mario, he jumped and simultaneously pulled a shell out from his backpack. Before he landed, he lobbed it at Diddy. Diddy stood, the next barrel high above his head, ready to throw. The sadistic joy in his face turned to shock, then terror, as the shell made it’s way up the hill and plowed right through him. Diddy flew into the air, barrel’s cascading around him, and then landed on his head. I love you Michael. Happy Birthday!